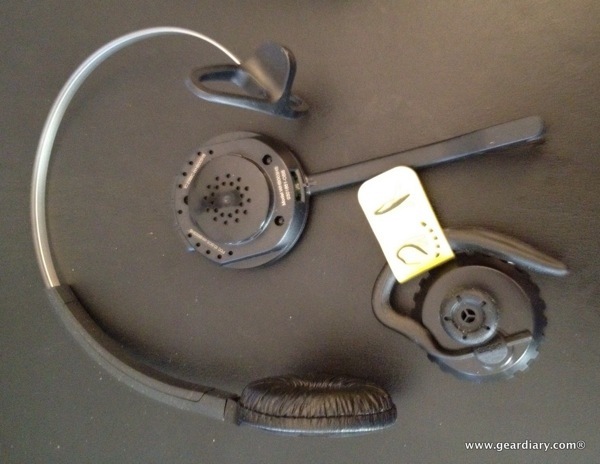 Back in July we took a look at the uber-cool Sennheiser OfficeRunner Headset. It comes with a base that was designed by someone with a keen aesthetic sense and it sounds great. In fact, I’ve been using it at the office ever since. It does, however, offer a few significant downsides. It takes up a bit of desk space, has a few too many cumbersome wires and it is pricey! The one we reviewed included the handset lifter and was close to $400. (The unit alone is $299.95 in our Amazon Affiliate store.) Jabra has also released a line of headsets for wired phones. They are lighter, a bit less complicated and a good deal less expensive. I’ve been using the $199 Jabra 900 headset I was sent for review for a bit now and thought I would share a few thoughts. Simple. Professional. Affordable. The Jabra PRO™ 900 series is the simple, reliable and affordable way to go wireless. It is a professional entry-level headset series that offer all the essential features of a wireless headset in a simple design at an attractive price point. 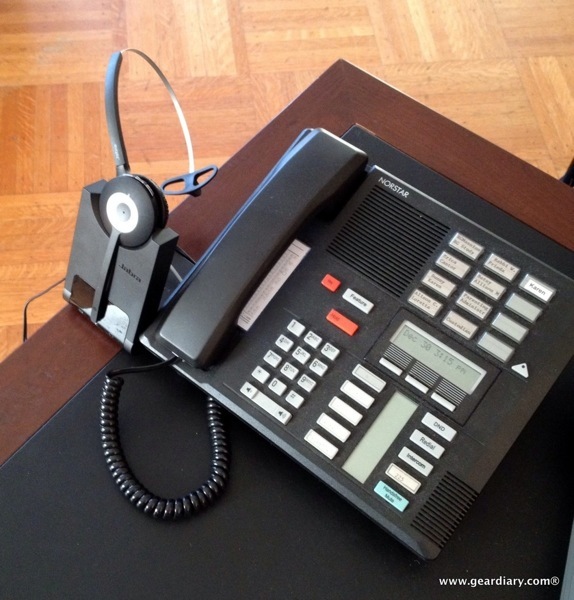 The series includes two versions: one for desk phones and one for Unified communications and PC-based telephony. Greater productivity and comfort: Jabra PRO 900 headsets free users from their desk, enabling them to find documents and multi-task with maximum efficiency while on a call. Apart from being able to walk and talk up to 120m/350ft away from their desk, users will also benefit from enhanced ergonomics. True Jabra quality sound: Jabra PRO 900 headsets offer crystal clear audio and quality enhancing features such as Jabra SafeTone™ that protects hearing by cutting off loud noises and securing safe average sound levels. The noise-canceling microphone blocks out unwanted background noise from the office. Easy to deploy. Easy to use. Jabra PRO 900 headsets are optimized with all leading desk phone systems or Unified Communication platforms making them very easy to deploy. The simple and intuitive call-control buttons make it easy to control calls from the headset. The company refers to the Jabra 900 as “simple, reliable and affordable”. Elsewhere they refer to it as an “entry-level” headset. It is all those things but, thankfully, that doesn’t translate into “cheap” or “poor quality”. The headset itself is much lighter than the OfficeRunner. In fact, the latter headset feels like a much higher quality offering. At the same time, I suspect that the fact that the Jabra 900 is quite light will be a positive for many people. It is light and quite comfortable. It also offers the choice of either using a headband or an ear loop.I opted for the headband as I find it much more comfortable over an extended period of time. 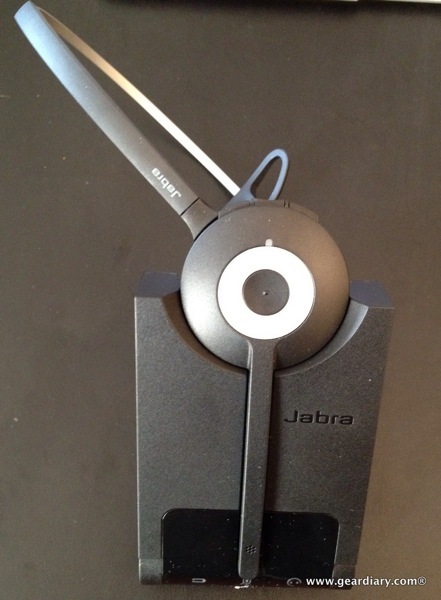 The Jabra 900’s base doesn’t have the cool, industrial design of the OfficeRunner. It is far more utilitarian: light, simple, unassuming. 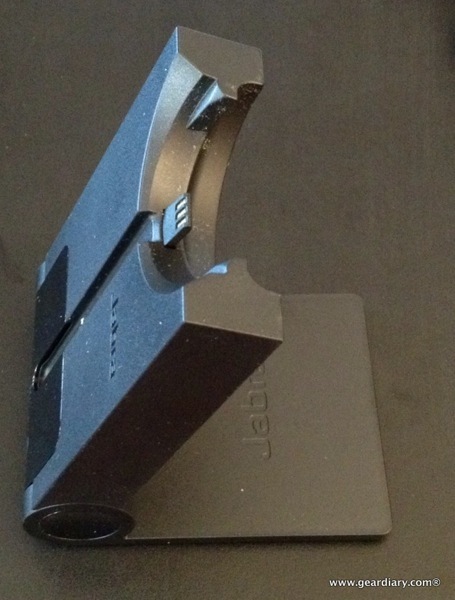 Again, this isn’t a knock on the Jabra 900 by any stretch and I suspect many will prefer the small, simple design. Let’s talk specs for a minute. The headset weighs just 27g. It has an effective talk range of 325 feet, offers 8 hours of talk time and has 36 hours of standby time. And it charges fully in under three hours! Obviously, since the headset is wireless there has to be a way to charge it. That is accomplished via the small, hidden port under the microphone boom. 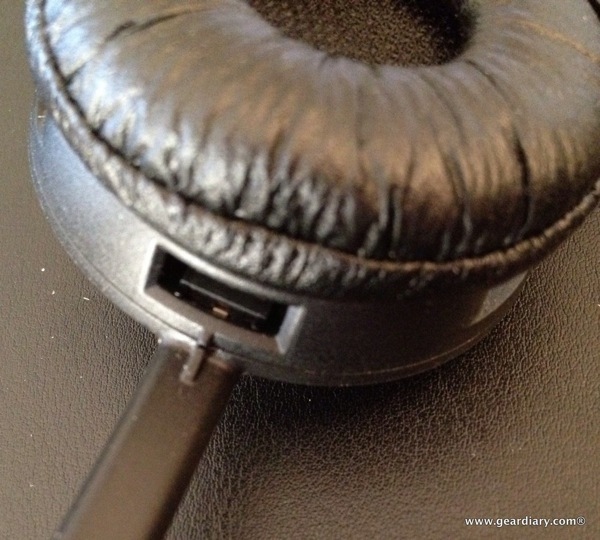 The headset easily snaps into the base and begins to charge. 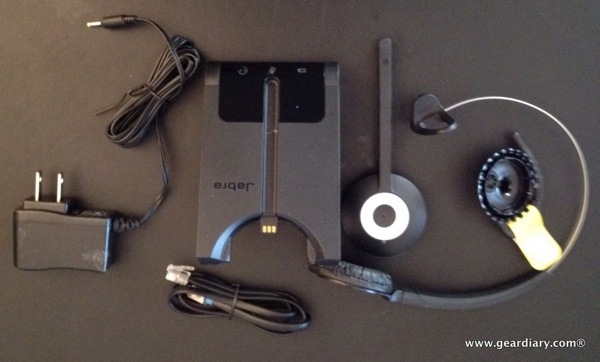 It is a simple but effective system and placing the Jabra 900 on the charger takes just a second. Within 20 minutes you will have enough charge to used the headset for a few calls. There are a number of ways to set up the Jabra 900 to work with your wired phone and all are depicted in the setup guide. There is a simple approach that lets you switch between the headset and the handset by pushing a button on the earpiece to using the headset with a handset lift (sold separately). I opted to use the simplest approach since… well it is simple. I also went this route in order to keep the cords and cable to a minimum. With the simple connection setup I was able to do just that. Personally I love the convenience of not having to hold a phone and be tied to my desk but that only makes sense if the headset you are using works well and has a decent range that doesn’t start crackling when you move a few feet from the base. Thankfully the Jabra 900 fits the bill. It sounds very good, has excellent range and is comfortable. Of course, that’s not surprising since it comes from Jabra and has a noise-cancelling microphone. I’ve used it for numerous calls and all of them sounded clear on both sides of the conversation. You can learn more on the Jabra website. What Needs Improvement: Less expensive than other options but still costs.